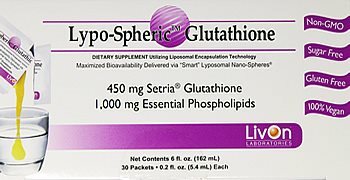 Lypo-Spheric R-ALA (R-Alpha Lipoic Acid) (GUARANTEED NON-GMO) by LivOn Labs - A powerful antioxidant that enhances glucose utilization in the muscle cells to promote increased lean body mass - 30 packets per box Carton. Note: This product line is available for U.S. customers only. R-Alpha Lipoic Acid (also known as R-Lipoic Acid) is one of the body's most powerful intracellular and extracellular antioxidants that can: It's a powerful Antioxidant Promote and maintain cellular energy production. Recycle other vital antioxidants like vitamin C and vitamin E. Promote healthy insulin sensitivity. Promote and maintain cellular energy production in nerve cells. ALA works in conjunction with several enzymes in the mitochondria, the engine of the cell, where food is turned into energy, and therefore is an essential component for energy synthesis. It also promotes and maintains cellular energy production. Fact: there’s no better way to supplement with Lypo-Spheric R-ALA! 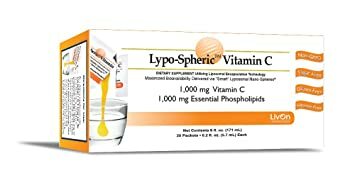 Dosage and Use As a dietary supplement, take one to two packets per day for boosting the immune system and maintaining cardiovascular, hepatic and glandular health. For best results, snip or tear the notched end off the packet, squeeze into your favorite cool beverage and drink on an empty stomach. We do not recommend mixing the product with a hot beverage or with any high-speed blenders or food processors. Storage Instructions Store in a cool, dry place. Do not freeze or place the product in direct sunlight for extended periods of time. Shelf Life When stored properly, the Lypo-Spheric R-ALA will stay 100% effective for a minimum of 10 months from the time of purchase. The expiration date is on the bottom of each carton and on each packet as “XMMYR”. *The descriptions, testimonials and information for this product are from the makers or manufacturer of the product. Madame Madeline is not the manufacturer or maker of any of the products sold. We do not make any claims or guarantees about them. Individual results of products may vary. These statements have not been evaluated by the Food and Drug Administration. This product is not intended to diagnose, treat, cure or prevent any disease.